FOUR full days off work without using up any annual leave is not exactly a regular feature on any national calendar – even in Spain where, if a month goes by without a bank holiday, the workforce starts to get tired and cross. So Easter is a perfect chance to grab a quick getaway – and, with a world of options within Spain itself, you don’t even need to worry about inflated holiday flight prices. For the uninitiated, Spain is a beach destination par excellence, and although the usual sweltering summer weather is some months off, the spring sunshine means you might be able to grab a couple of hours in the middle of the day soaking up the rays, but don’t expect it to be hot; you’ll have to wait until June or July for that. And, actually, Spanish beaches have become victims of their own success: those who just want hot weather, relaxation and a tan have the bottom half of Europe and the top half of Africa to choose from, at similar prices and without the hassle of long-haul flights; yet with Spain having won the stakes as a sunseeking Mecca means few bother to look beyond the coast to see what else this incredibly versatile country can offer travellers. Basically, holidaying in Spain and spending your time on the beach is a bit like heading to Rome or Paris and sitting in a bar all day and night – a terrible waste of tourism gems. The Easter break is a great chance to savour some of these without committing yourself to a two-week annual holiday – and hopefully, will inspire you to come back for more. Probably one of the safest and most welcoming countries for kids, the list of fantastic, fun and educational breaks that suit the little ones is literally endless, although most of these options are also brilliant entertainment for adults, with or without children in tow. 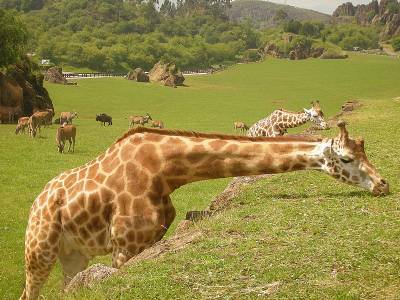 Head for the northern region of Cantabria, the capital of which is Santander and well-served by budget airlines, and book a trip to Cabárceno Park – a safari centre that feels anything but man-made. Its dramatic, prehistoric-looking landscape, of cracked mountains and shafts, is the result of a mine explosion, and the animals within it run wild. Elephants, giraffes, lions, tigers, wolves, and even unbroken wild horses roam the landscape, barely aware they’ve been taken out of their natural habitat, given that the acres and acres of open countryside they live in have been carefully designed to reflect what they’re used to. Humans provide their food and veterinary care, but otherwise, don’t intervene. As well as a great chance to breathe in some fresh air, hike through the open countryside (no rambling skills needed, it’s relatively easy for even the least fit) you’ll witness African wildlife in a way that’s hard to find outside the Masai Mara and Kruger Park. If you’d rather travel somewhere this Easter by train, the Bioparc in Valencia is another superb, animal-friendly safari experience, but a very different one: the Turia riverbed, which was made into botanical gardens after the water course was diverted following the Great Flood of ’57, is home to roaming animals who are generally free to do what they like but are so used to the presence of humans that you can safely stroke some of them as you stroll around the gardens. Also in Valencia, the Harry Potter exhibition opened a week ago and, at €16 for an adult ticket, is exceptional value for money – catch it quickly before it moves on again in July. All this, without counting the water parks (Aquópolis in Cullera and Torrevieja, Mundomar in Benidorm, for example) adventure parks (Terra Mítica in Benidorm, Portaventura in Barcelona) interactive museums, and of course, the biggest aquarium in Europe, the Oceanogràfic in Valencia, whose role goes beyond sightseeing: turtles and other sea creatures rescued all along western Mediterranean shores are taken to the gigantic underwater wonderland to be treated by specialist vets and nursed back to health. 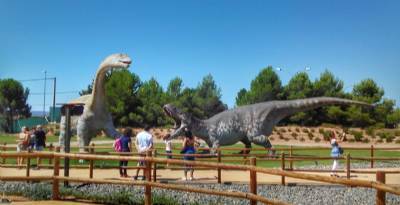 For prehistoric adventure, head to the province of Teruel and pop to the must-see Dinópolis theme park (first picture) – based on a site where genuine dinosaur remains have been found, this is one of the most complete refuges for these ancient creatures in the whole of Europe, and it’s been designed to appeal to kids as well as adults intrigued about some of the earth’s earliest inhabitants. Practically anywhere in Spain is suitable for hiking, and anywhere along its coasts are perfect for watersports – facilities are ideal for expert surfers, sailors, potholers and mountaineers, but all of these areas are replete with centres that are fully geared up to taking total beginners, even nervous ones, by the hand. 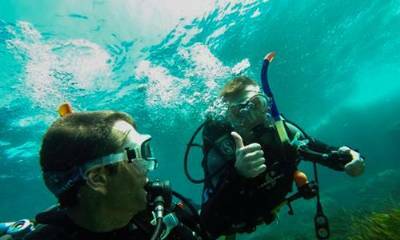 In four days, you could learn scuba-diving off the Costa Blanca, break yourself into kite-surfing or paddle-surfing, or even learn to sail a yacht. Now is the ideal time for these activities, since if you get wet, you won’t freeze, but it won’t be too hot to wear a neoprene suit. Indeed, many watersports can be practised in relative comfort in almost any temperature. Even though summer is starting to feel as though it’s on its way, some ski slopes are still open – Cerler and Formigal-Panticosa in the Pyrénéen province of Huesca, for example – and deals on hotels, lift passes and equipment hire for Easter are now being launched via the Aragón ski resort management agency, Aramón, which also advertises walking and hill-hiking trips in the mountains of Teruel now that their ski slopes have melted until December. Spain is excellent riding country, too – most provinces have several equitation centres where beginners can get started and experienced horsewomen and horsemen can enjoy a relaxing or thrilling hack, whichever appeals to them most. No doubt the top monuments and cultural attractions in Spain are either on your list or you’ve already seen them, or at least, they’re the first ones that spring to mind when considering a city break in the country – Granada’s Alhambra Palace, Barcelona’s Sagrada Família cathedral, Parc Güell and Montjuïc, Madrid’s Royal Palace and its ‘big three’ art museums, the Reina Sofía, Thyssen-Bornemizsa and El Prado – but there are scores of others of international renown and, in fact, Spain has more UNESCO heritage sites than anywhere else in Europe. Roman ruins abound at Santiponce near Sevilla and at the MARQ museum not far from Alicante’s Santa Bárbara castle, which is worth the climb for the views alone. Santiago de Compostela (Galicia) and Burgos (Castilla y León) are home to cathedrals so spectacular that you run the risk of being ruined for every other one in the world you might see. 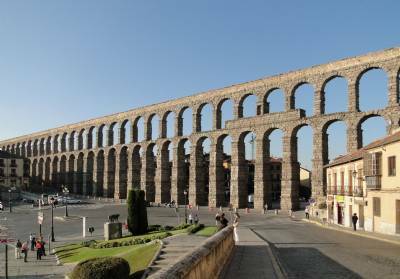 The massive aqueduct in Segovia (Castilla y León), the ancient walled cities of Toledo and Ávila, the classic university city of Salamanca – often dubbed the ‘Oxford of Spain’, and the huge amphitheatre in Mérida (Extremadura) should be on everyone’s travel bucket list, and if you’re on the east coast, you cannot miss the Roman amphitheatre and ruins in Sagunto, north of Valencia. Travelling beyond your province or region is also a chance to see a very different side of Spanish life: cuisine, countryside, buildings, and people with vastly diverse outlooks on life: more rural and close-knit, or more cosmopolitan, moulding to their surroundings.